The Environment Ministry is planning to make next year’s Ardh Kumbh Mela in Allahabad plastic-free in line with the country’s commitment to eliminate single-use plastic, Union Minister Harsh Vardhan said. India was the global host of 2018 World Environment Day. The theme of this year’s edition was “Beat Plastic Pollution”. “We are intending to have a plastic-free (Ardh) Kumbh next January. We are starting preparations (for it),” Vardhan said. He acknowledged that making the Ardh Kumbh plastic-free will be an uphill task. “We are working on making this (Ardh) Kumbh plastic-free as it is a very tall order but it is a part of our (government’s) dream. We are already working towards beating plastic pollution all over the country but imagine a plastic-free Kumbh. It is something we are planning to do next,” Vardhan told PTI. Ardh Kumbh Mela, one of the world’s largest religious gatherings, is held every six years. It will be held in January next year. 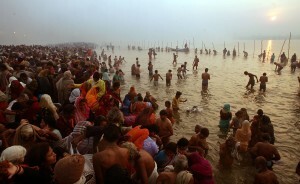 Millions of Hindu pilgrims stream to Allahabad to bathe in the holy river Ganga to wash away their sins during the festival. The Government’s idea of a plastic-free Ardh Kumbh was welcomed by environmentalists. It is a “fantastic decision” but the success of a policy depends on its implementation. So if it can be implemented properly, then nothing like it, environmentalist Padmavati Dwivedi said. Environment activist, Jagannath Poddar, pointed out that the move will have to be implemented strictly. “The use of plastic has increased because public has become lazy. Having a plastic-free Kumbh would require strict implementation,” he said, stressing that people need to use plastics sensibly. He recommended finding alternatives to plastic. Newspaper bags would be an effective alternative for plastic bags, banana leaves can be used instead of plastic plates and earthen pots can be used for storing liquids, Poddar said.